WHAT: BioScrip Infusion Services, Inc., formerly CarePoint Partners, is celebrating the opening of its new state of the art ambulatory infusion suite at 5401 Jefferson Highway, Suite B, with a ribbon cutting and press conference followed by tours. This new facility represents the innovation and excellence in patient care for which BioScrip has become known. Jefferson Parish District Two Councilman Paul Johnston, National Chief Operating Officer Harriet Booker, South Region Vice President of Operations Kim Harvey and Jefferson Chamber of Commerce Chairman of the Board Ryan Daul will deliver remarks. state of the art facility will directly follow the ribbon cutting and press conference. WHY: The opening of BioScrip’s newest ambulatory infusion suite represents a significant investment in Louisiana’s healthcare system and the New Orleans area community. This new location will add to the nine locations already present throughout Louisiana. As a national publicly traded company, BioScrip’s regional workforce includes New Orleans, Covington, Hammond, Lafayette, Houma, Lake Charles and Baton Rouge, among others. BioScrip reports hospital re-admission rates far below the national average, administering life sustaining medicine to the community through anti-infective therapy, cardiac care, nutrition support, immunoglobulin therapy, transplant care and hemophilia care. 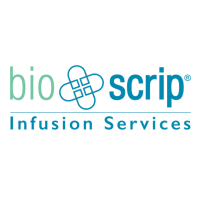 BioScrip Infusion Services, Inc., formerly CarePoint Partners, is the largest independent national provider of infusion and home care management solutions. Specializing in infusion therapy, BioScrip entered the Louisiana and Mississippi markets in 2013 through the acquisition of CarePoint Partners, officially transitioning in 2017. Today, BioScrip is the market leader in its industry in Louisiana and Mississippi with a strategic focus on excellence in patient care, reporting hospital re-admission rates far below the national average. For more information on BioScrip, please visit www.bioscrip.com or call 720.697.5200.